There are twelve miles of hiking trails on Monhegan. All summer long visitors try to see as much of the island as possible by traversing it at an often furious pace. A few weeks ago Jonathan and I tried to circumnavigate the island and still make it back to the ferry on time. 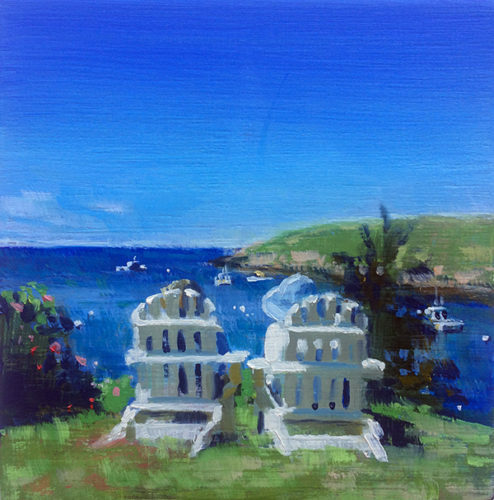 While walking back down the hill to the harbor just moments before our departure I noticed two women sitting on adirondack chairs, looking south to the horizon between Monhegan and Manana. Weren’t these the same two I saw when we started our trek earlier in the morning? They weren’t talking, just relaxing and taking it all in, the warm sun soaking into their faces. They were a nice reminder that we all have different ways to spend a summer day on an island, and that truly seeing and experiencing a place isn’t something measured in numbers.